Late last year, SDLP councillor Niall Kelly suggested that Belfast City Council stream its meetings online (and make the archive of recorded footage available) to increase accountability and civil participation. The idea was bounced from the main council to the Strategic Policy and Resources Committee, and then back to the full Council last week. ... at its meeting on 23rd May, 2008, it adopted a set of recommendations of the Audit Panel in relation to a Code of Governance for the Council. Part of that Code committed the Council to “taking informed, transparent decisions which are subject to effective scrutiny…..” It is certainly the case that the live streaming and archiving of Council Meetings would be in line with this commitment. Furthermore, the Council's promotion of a Customer Focus approach commits it to providing the public with as much information as possible about the Council’s decision-making processes and the live streaming and archiving of meetings would be consistent with such a customer focussed service delivery. They talked to the NI Assembly and Dublin City Council and eliminated the need (and substantial cost) of a broadcast quality system. The option that won the committee’s recommendation was a lease scheme. The system used by Dublin City Council would seem to be effective in delivering the service. This system provides live streaming of high quality video feed from moveable cameras, providing viewers with on-screen information, including details of the meeting agenda and of individual speakers, and will archive the footage in a manner that can be retrieved and viewed through the Council’s website. The system would be leased from a company which specialises in providing this service. There would be no initial capital cost but it would require an annual leasing charge of approximately £20,000. It would be the responsibility of the company providing the service to update the equipment and to provide maintenance when appropriate. These costs are included within the aforementioned figure. This option could result in an approximate cost to the Council of £60,000 over three years. The alternative of purchasing the equipment outright and training up Council staff to maintain it “could result in an approximate cost to the Council of £80,000 over three years”. At the 1 November meeting of the full council, the motion was “supported by the SDLP, Sinn Fein and members of both the DUP and UUP” and passed despite Alliance protests about the financial outlay. Though spending a small amount to improve the overall council process might be a good investment and save a lot of wasted money in the long term. On his blog, Councillor Niall Kelly commented on the level of debate and other councillors’ reservations about the scheme. We had quite a spirited debate about this in the P&R committee with a few members giving some strange reasons for opposing this plan. The main argument against was that some of the debates we have at the monthly council meeting are so awful that it could be embarrassing for the public to actually goes on in the chamber. The idea behind this motion was to increase the level of accountability and transparency which exists in council yet those who opposed it thought that the behaviour of some members would be open to more scrutiny and could be embarrassing. My response, and that of other members, was that if the public saw some of what constitutes ‘debate’ in the chamber then it should be the members in question, and not the public, who should be embarrassed. 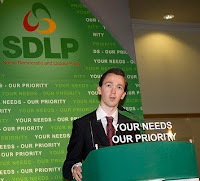 I caught up with Niall Kelly at the weekend's SDLP conference and asked him about the innovation. It's funny that the real objections are often regarding how the happenings would be viewed in a negative light. Perhaps streaming and transparency would lead to actual progress? The one problem I really have with this proposal is, from what I can see, that it will actually broadcast committee meetings also. Now, these are meetings to which the public are currently not allowed access - for very good reasons - because of the nature of discussions, the need for confidentiality of some issues, and the fact that you actually will achieve better outcomes often if discussions are held in private and Cllrs don't feel the need to "play to the gallery". Why these meetings need now to be streamed on the internet actually seems to be taking things too far. Main monthly Council meetings yes, but Committee meetings no. Surely that's what the meaning of a meeting "in committee" actually means - its private. All in the search to be trendy however and appear to be 'transparent'. It'll come back and bit on the proverbial at some stage though. At the start, I understand that it's only the main council meeting. Committee's come later. The public are allowed to sit in on committee meetings too ... they just have to stand outside during the minority of "in committee" items on the agenda. So presumably, they'd just cut the streaming for the private parts.